Bio Rick & I joined GWRRA in 1996 when he had a 1994 Wing, but we met years before when he moved to Phoenix with his 350 Kawasaki and started cruising Central Ave. He moved up to a Honda 750, then a Kawasaki 900, a Yamaha XS 1100 and then we moved to San Diego where he bought his first Wing. He purchased a 1997 red & white Valkyrie as his "mid-life crisis" bike, which I promptly stole from him and called my own. I got my Wing in 2002 and have over 139,000 miles on it and plan on putting on a bunch more with all the rides and trips we'll be doing this year. We've been very active since joining, holding various chapter positions, moving up to California District Directors and Assistant Region Directors for several years. We are happy to be the District Ride Coordinators and look forward too many rides with you all. Bio During 1997 I took the beginner rider class to understand what Peter was doing as the motorcycle rider. After the class I purchased a Honda Shadow - 1100cc. 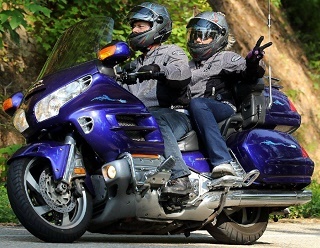 In 2001 I purchased my first Gold Wing, more comfortable for long rides. Peter & I joined GWRRA Chapter L in September 1994. I’ve held every Chapter L office except Educator between 1994 and 2010. I was also the COY in 1997/2009 and the IOY in 1999. In 2010 I joined Chapter E and until 2017 was their Treasurer and Newsletter Editor and in 2017 the COY. I have been the District Newsletter Editor for over eight years. I was a flag bearer with the Colorado Wings Drill Team, and have ridden in all 50 States, all the Canadian Provinces, and Mexico. Bio I started riding motorcycles in 1980 in Grand Rapids, MI. My first motorcycle was a 1980 Honda 500 CX Deluxe, modified with a Vetter fairing with radio and luggage rack. After returning from Germany, I bought my first Goldwing in El Paso TX. I took some safety classes to learn how to ride safely. After several tours overseas, my family and I settled in Colorado Springs, CO. 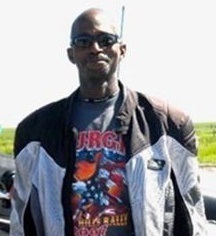 I became an instructor in 2001 to teach people how to ride safely. Over the years, I have owned five different Goldwing motorcycles. I currently ride a 2005 Anniversary model Goldwing. Ride safe and keep the shiny side up. Bio We purchased a 2008 in Titaniumt Wing in 2011. In 2013 we converted it to a trike, and after years of always being a co-rider, I got my first license endorsement for three wheels. We joined GWRRA in Sept. 2013. From the very beginning we knew that GWRRA was going to suit us. Where else can you find such supportive riders? Whether you have a Honda or not, everyone is welcomed. Steve got his 2008 Gold Wing in 2015. We are currently chapter directors at CO-G. We enjoy the impromptu or scheduled day rides and love the camaraderie of multi day rides. GWRRA has been an instant family of helpful, friendly people! Bio We purchased a Purple Gold Wing in 1995 and Al Jenson helped us join GW. 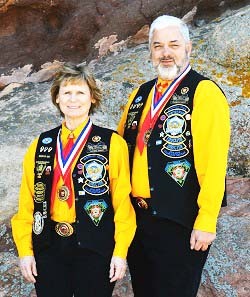 In 1996 we joined Chaper A and in 1997 we attended our 1st Wing-Ding in Billings, Mt. and became the District Webmasters. In 1998 to 2001 we were the District Newsletter Editors. We were honored to be the 1999 Chapter A Couple of the Year. We became Life Members in 2015. Best of all we became members of the GW family and have enjoyed every minute. Thanks Al!! Bio We are very happy to be Couple of the Year Coordinators. We joined GWRRA in 2009 and became members of “Ironclad Wings”, Chapter L, in Chesapeake, Virginia and were the Rider Educators. In 2012 we moved to Colorado abd became members of Chapter L, “The Red Rocks Wings”. Andy became the Rider Educator, and Sherry the Motorist Awareness Coordinator. We soon became the Assistant District Trainers, and then the District Trainers. A very short time later we became the Assistant District Directors and then the District Directors. Three years later, we accepted the position of Region “F” Directors. As a former Region F Couple of the Year, we are excited to be part of the new COY program and hope to meet everyone who is or may be considering the COY program. Bio I’ve ridden motorcycles most of my life and joined GWRRA in 1994. 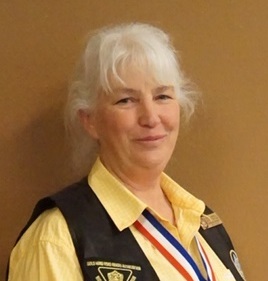 I held several positions with Chapter L, including Rider Educator, Chapter Director and COY in 1997/2009. I joined the Colorado Wings Drill Team in 2010, first as a Support Team member and then as a Team Rider. 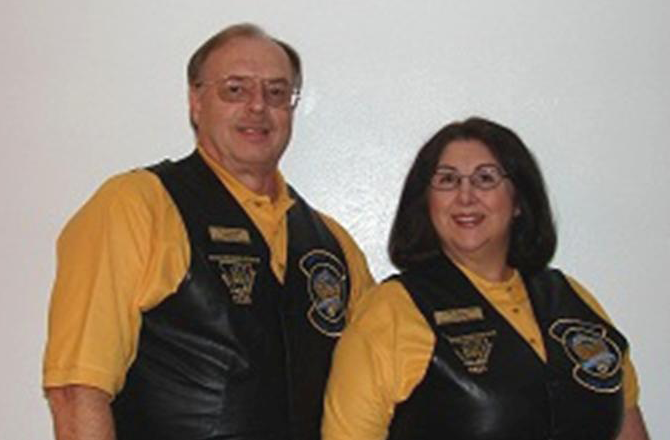 April & I joined Chapter E in 2010 and became the Rider Educator and in 2012 the COY. I became a Life Members in 2015. Since 1995 we have attended nearly every Colorado District Rally and 15 Wing Dings. I was a MSF and GWRRA Certified Ride Instructor from 2010 to 2015. I became District MAP Officer in 2016. April & I have ridden motorcycles in all 50 States, all Canadian Provinces, and into Mexico.